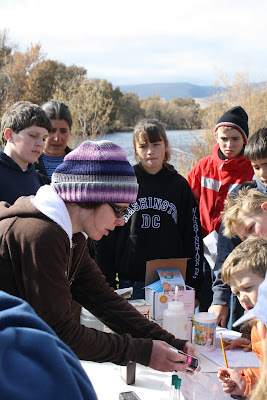 Photo Above: Dr. Michelle Anderson helps students use scientific tests to assess the water quality of the Big Hole River. 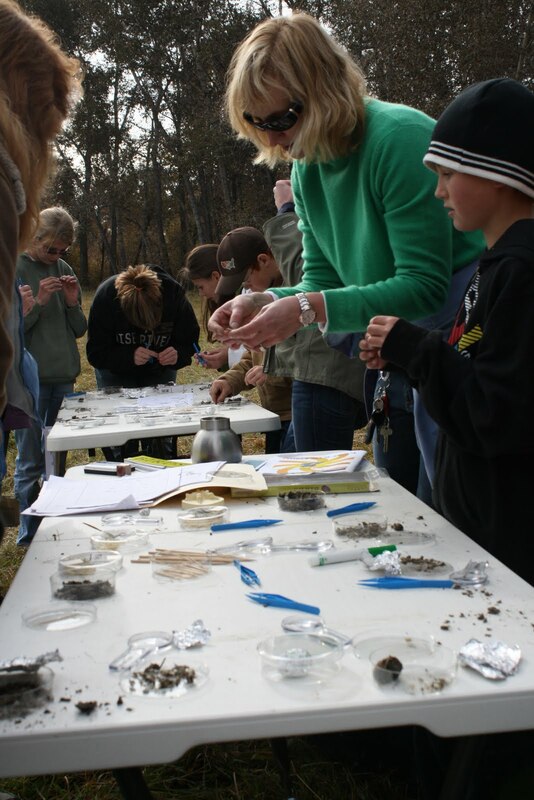 On Wednesday, October 21, 2009, the Big Hole Watershed had its first Big Hole River Youth Field Day. Jami Murdoch, the Big Hole River Foundation’s Outreach Coordinator, and CFWEP co-organized the event, introducing the students of the Big Hole Valley to water education by sharing hands-on, place-based, scientific knowledge of their watershed. Throughout the day, students traveled through six stations. Each station’s focus had a direct connection to the Big Hole. In “A River Runs Through It”, students took a hand in mapping their watershed as they explored the run of the Big Hole River and its tributaries. At “The Grass Isn’t Always Greener”, students learned the importance of a diverse plant community and the effect of noxious weed to the watershed. “What is ‘High Quality H2O’?” found students, assisted by Dr. Michelle Anderson from UM-Western, performing sophisticated scientific tests on water samples from the river to determine what water quality parameters are necessary for a healthy river. At “A Bug’s World”, students interacted with aquatic insects to learn the importance of the variety of stream bugs in the river. The station also tied into the Big Hole River’s salmonfly hatch that draws anglers from around the globe, an important source of money for the local economy. “Something Fishy” focused on the different fish of the Big Hole, particularly the fluvial, or river-dwelling, arctic grayling, whose numbers have dwindled in recent decades. Finally, at the charmingly titled “I Eat, Therefore I Puke”, Dr. Amy Kuenzi from Montana Tech helped students investigate one of the Big Hole’s avian residents, the owl, and its need for mature cottonwood forest to provide habitat for the critters it eats. Photo Above: Students learn about the types of food on the menu for owls with assistance from Dr. Amy Kuenzi. The Big Hole Youth Field Day was only possible thanks to the immense support of a dedicated group of volunteers from around western Montana. A special thanks goes out to Insty Prints of Butte, who gave us a sweet deal on the Big Hole River Watershed Passports used for this event.